Basil, from the Greek basileus, which means “King”, is a wonderful aromatic herb that adds flavour to many foods. The most common use of basil is for tomato sauce and pesto. 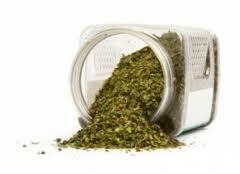 I like to sprinkle dried basil over salads and sliced tomatoes, for which it has a particular affinity. Basil also pairs up alluringly with onions and garlic. Since I use so much basil, when I saw a giant 26 ounce container of dried sweet basil selling for just a couple of dollars, I bought it. A friend calls it “a lifetime supply”, but I doubt it. This wonderful king of herbs is widely used for Thai dishes as well as Italian cuisine. Soups, stews, compound butters, flavoured oils and of course Pizza, Focaccia and Bruschetta are all enhanced by basil. I’m happily using dried basil every chance I get but if you don’t make use of it often, here are a couple of applications you might be interested in knowing about. This goes well on broiled fish fillets or blanched broccoli spears. This easy sauce is fabulous for corn on the cob. For either sauce, combine all and heat in microwave or stovetop. I love basil. For sliced ​​tomatoes I use oregano and olive oil with some salt. Okay so if you love basil so much you are doing yourself a disservice by using dried! Once you use fresh you won't be able to go back. It's easy to grow even on a window sill indoors in winter! By the way thank you for your concern about my Yorkie, Hershi. I didn't mean he was really in heaven only heaven on earth. He is very much alive and well at only two and a half. And boy does he love mommy's short rib bones! LEt me first convey my heartfelt thanks for visiting my blog. Please do visit and if you like, please follow it. I love love basil ~ a great informative post! I use it quite a bit for Italian dishes. I wish I knew more about Thai food. Love basil, grow it fresh in my garden...so yummy !! Wow that is a lot of basil. I've only ever grown it in a small herb container garden. We don't put our vegetables in until late may or early June. Even then the vegetable garden is small.Sounds like you've got a great crop growing. Nothing like fresh vegetables from your own yard!! I also loved basil but never knew what to do with the dry stuff. Thanks! the parmesan sauce with dried basil keeps me hooked- good one ! I love fresh basil, but dried basil not so much. However, I can't do without it when making pasta sauce. and ... now ... I'm hungry. Uh - YUM! thanks for the ideas. this is a simple superb post...i love the lemon butter sauce; yes a terrific topper for fish.